Long Rider Mefo Phillips is riding from Canterbury to Rome! Mefo Phillips, having completed her ride from Canterbury to Santiago di Compostela, has also completed her pilgrimage to Rome! Her route took her across France via Arras, Laon, Reims, Chalons-sur-Marne, Troyes, down through Burgundy and across the Alps. 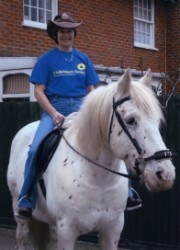 "I'm now back from riding my spotted horse Leo to Rome in memory of my mother, Dickie Pares, who was struck down by Alzheimer's after a lifetime as an independent spirit, and who died 18 months ago. She was a great traveller and writer of horsy books, and I've inherited her itchy feet and her love of words. The scallop shell sewn on my hat in the photo is the emblem of St James. It was an amazing trip and the toughest thing I've ever done. We were in the mountains for 500 miles, crossing the Jura, the Alps and then the Appenines, and in Italy the temperature reached 46 degrees with 100% humidity ... only mad horses and Englishwomen went out in that! And there were appalling storms, mosquitoes and lethal horseflies with psychedelic green eyes. But there were amazing highs too, such as finding rare bee orchids growing beside the bicycle route from Givry to Macon; rounding a corner in the Alps to see Mont Blanc rearing up ahead of us; riding round Lucca on the mediaeval city wall, and arriving in Rome (on 18th August) and riding right into St. Peter's Square after a mile tiptoeing down a one way street in the wrong direction!" For more information about this journey, please visit www.justgiving.com/mefophillips. Mefo's book about her pilgrimage to Santiago has been published by Virgin Books Limited. Click here to go to Mefo's page on Amazon.co.uk.